Higgins Proteen Red Color Conditioning Egg Food for Red Birds. Ground Wheat, Wheat Flour, Dried Eggs, Corn Flour, Cane Sugar, Sea Salt, Brewers Dried Yeast, Wheat Gluten, German Millet, Hemp Seed, Cut Oat Groats, Niger Seed, Poppy Seed, Wheat Germ, Canthaxanthin, Potassium Chloride, Algae Meal, Tannic Acid, Vitamin B Supplement, Vitamin D3 supplement, Vitamin E supplement, L-ascorbyl-2-polyphosphate (source of Vitamin C activity), Zinc Sulfate, Ferrous Sulfate, Niacinemide, Folic Acid, Biotin, Manganese Sulfate, Copper Sulfate, Calcium Pantothenate, Thiamine Mononitrate, Pyridoxine Hydrochloride, Riboflavin supplement, Zinc Proteinate, Manganese Proteinate, Maganese Proteinate, Copper Proteinate, Menadione, Sodium Bisulfite Complex (source of vitamin K activity), Calcium Iodate, Sodium Selenite, Cobalt Carbonate, Vitamin B12 Supplement, Natural Annetto Coloring, dried enterococcus faecium fermentation product, fermentation product, Dried Lactobacillus Acidophilus Fermentation Product, Dried Lactobacillus casel fermentation product. 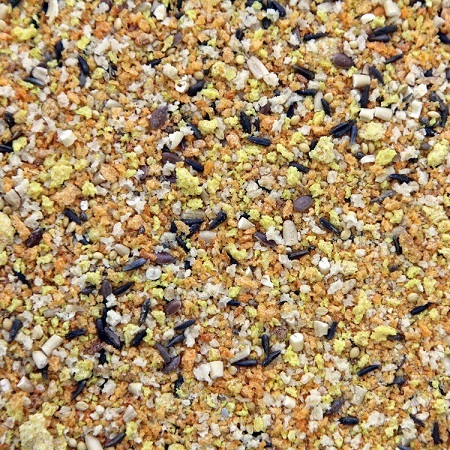 Be sure to try all the snack attack treats for your feathered friends.